A Koi’s health depends on the environment provided by you, the koi pond owner. Koi fish have a high resistance generally, but the stressful conditions can break down the immune system, as in humans. A stressed koi fish becomes sick. Prevention is much more easier than treating your koi fish. Some causes of stress are: high ammonia level in the water,low dissolved oxygen level in the koi pond, not proper handling of koi fish , moving koi fish, poor water quality, too much koi in the pond, parasites, too high or low water temperature, toxic chemicals, sharp edges in and around pond and not proper nutrition. Disease can be: bacterial, viral, fungal and can caused by parasites also. Bacterial koi disease can be: Flexibacter Columnaris (fin and tail rot), Aeromonas (hole-in-the-side), Pseudomonas or Vibrio. One of the principal causes of fish mortality is bacterial disease. Treatment: acriflavin, nitrofurans, oxytetracycline, kanamycin, chloramphenicol, sulfanomides, salt, and so on. Viral koi diseases can be: unfortunately there is no effective treatment except to remove growths by scraping. Fungal koi diseases may occur as a secondary infection near some other fish injury. Affects damaged or disturbed fish eggs. Some known treatment: acriflavin, iodine, malachite green, methylene blue, salt or formalin as a bath. Parasitic koi diseases can be the followings: Lernaea (anchor worm), Argulus (fish lice), Monogenetic Flukes, Ich, Trichophyra or internal parasites. Most fish carry some parasites. Stress situations or seasonal climatic variations may bring on infection. Treatment: Dylox, Masoten, Demilin, Formalin, Malachite Green, potassium permanganate or salt in the whole koi pond or in a bath. We can use some chemical treatments as external swabbing, injection, feed or bath in disinfectants 30 to 60 minutes. External swabbing with antibiotics and/or disinfectants can be very effective. Partial water changes are very effective also in improving water quality and decreasing stress. You need to use it wisely. 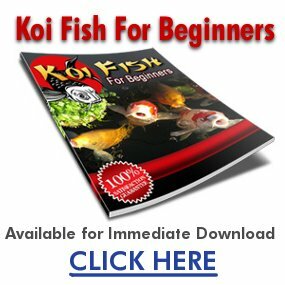 You can find free information and pictures about Koi Fish at Nicol’s Koi site.